Vibrant Coastal Inspired Colors and Hues! Sun*Kissed Designs. This image is property of Sun*Kissed Designs and Ashley Stubbs of dKin Photography. Loney wearing "Grace" Wedding Gown, Alex wearing "Breathless" Wedding Gown, Joy wearing "Allure" Wedding Gown of The Coastal Collection. Hair Artistry by Tone' Jackson of Tj Styles, Make-up Artistry by Joy Jewell. Welcome to the online studio for Sun*Kissed Designs! Sun*Kissed Designs is a couture design studio offering one of a kind, custom handmade and hand beaded wedding gowns, bridal accessories, artisan gowns, special occasion wear and accessories collections designed by Chantél F. Fielder! Beautifully designed pieces that are inspired by all things coastal, and are created from start to finish with hand beading and handmade embellishments. Flowers are hand beaded, one by one, to create an amazing design! Each piece is made of man-made or 100% silk fabric and the couture lines are made-to-order, and customized, making sure that each item fits perfectly! Established in May 2011 as a bridal studio, Sun*Kissed Designs has expanded to include gowns and accessories for bridal, special occasions and more recently artisan and Ready-to-Wear. Explore the Collections~ Bridal, Coastal, ~By the Sea~Jewelry, and Artisan~ and be inspired by designs created with women of all sizes in mind, where fine crafted luxury meets breathtaking designs! For more information about Chantél and Bridal Style Inspiration, click here "Bridal Style-Inspiration". At the bottom of this page, are links to Policies and our Media Kit and our social media links are below. 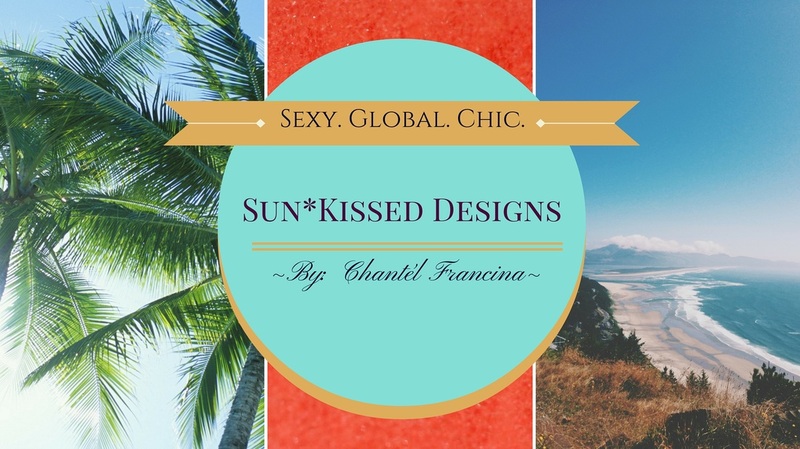 Unless otherwise stated, all images, clothing and accessories designs and information on this website and blog are the property of Chantél F. Fielder and Sun*Kissed Designs and are protected under Copyright. To Shop Our Ready To Wear, Travel and Accessories Collections! Just Click The Image Below! Sun*Kissed Designs Now Offers Rare Products in Our Handmade At Amazon Store Location! Click Here or Visit www.amazon.com/handmade/thesunkisseddesigns To Shop! Sun*Kissed Designs. "Adore" Wedding Gown. This image is property of Sun*Kissed Designs and Wendy Wang Dulce Life Photography. Allison Nance Blessed Events. Model Vivian Vy Nguyen. Make-up June B. Xu JBX Studio. Sun*Kissed Designs. "Loved" Wedding Gown of The Coastal Collection. Ashley Stubbs/ dkin Photography. Model: Joy Jewel. This image is property of Sun*Kissed Designs and dkin Photography. Sun*Kissed Designs. "Loved" Wedding Gown of The Coastal Collection. Model Joy Jewel. Ashley Stubbs/ dkin Photography. This image is property of Sun*Kissed Designs and dkin Photography. Sun*Kissed Designs. "Adore" Wedding Gown of The Permanent Collection. This image is property of Sun*Kissed Designs and Wendy Wang Dulce Life Photography. Allison Nance Blessed Events. Model Vivian Vy Nguyen and Michael Bou-Nacklie. Make-up June B. Xu JBX Studio. Sun*Kissed Designs was published on Hey Wedding Lady on 10/23/13, as part of the photo shoot concept by d Kin Photography! What are your gown needs!? Google+ Visit the Sun*Kissed Designs Google+ Page!